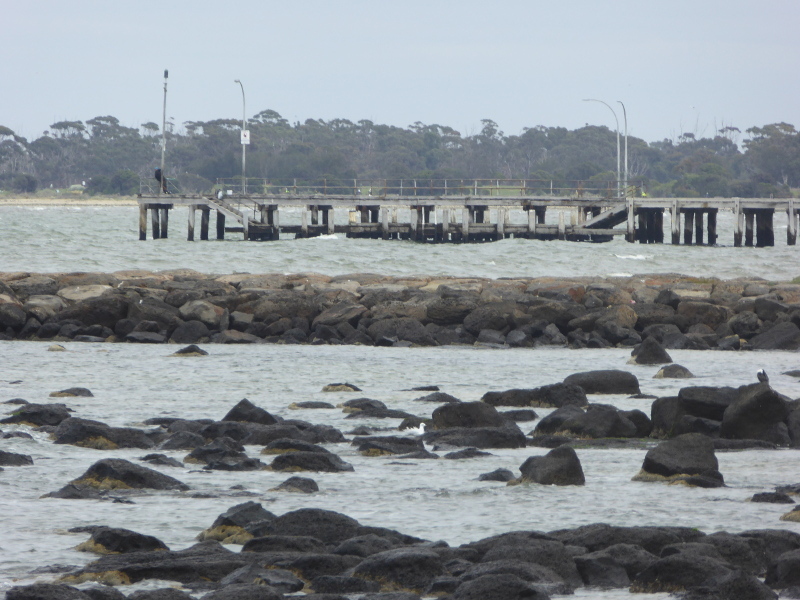 Altona Pier reaches a long way out over the water of Hobsons Bay. 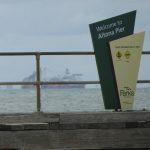 The information sign on the shore suggests that it needed to be this long because it had to cater for steam ferries that berthed here when the pier was first built in the late 1880s. And sure enough, down at the far end, you can see the structure of the pier changes, with steps down to a lower level, from which passengers no doubt used to embark and disembark. There is also a solid metal mooring post on each side for those ferries to attach themselves to the pier. 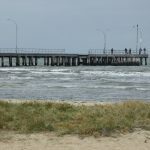 It’s a long, straight pier, with wooden boards starting after just a few yards, raised just slightly higher than the sand on Altona Beach for the first 50 metres or so before you reach the seaweed line of high tide. 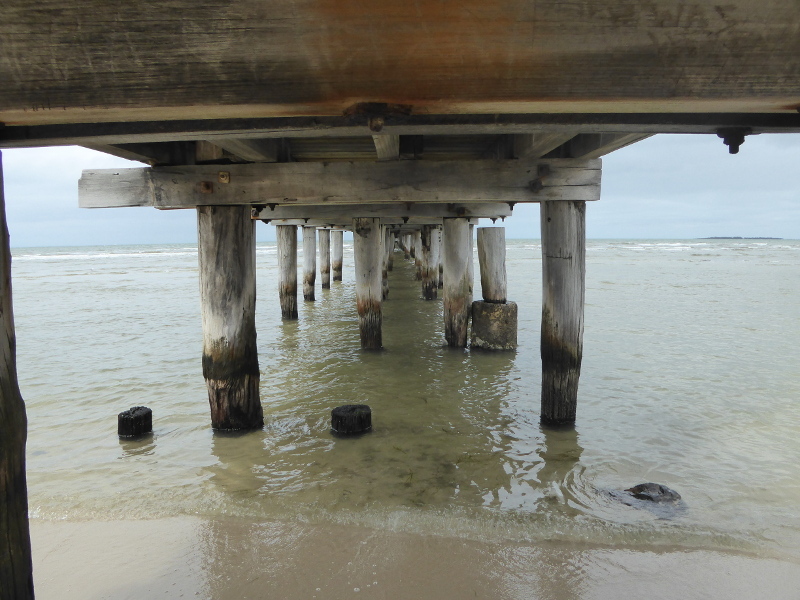 I was there at low tide, so it must have been a good hundred metres before the water got deep enough below the boardwalk for the sandy bottom to be invisible. 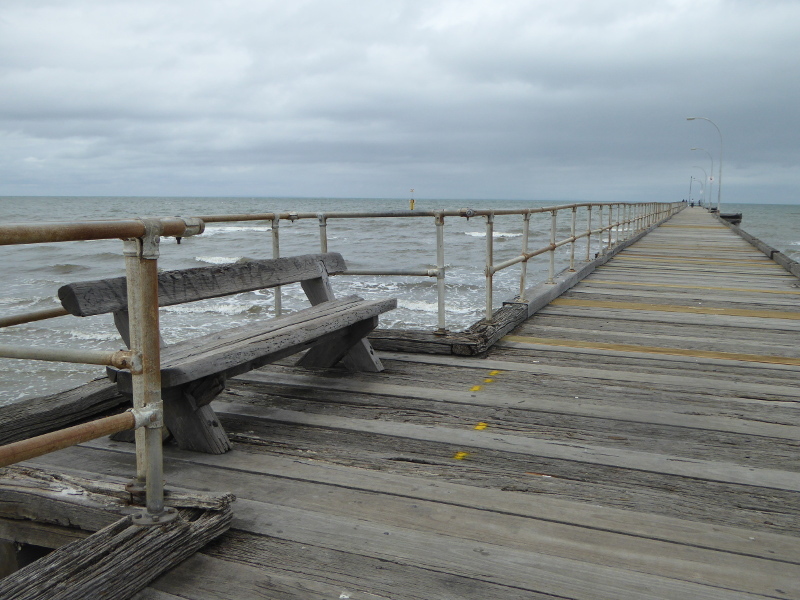 The single bench about a quarter of the way along the pier probably marks the point at which the water gets deep enough to swim, though I would hope nobody jumps off this pier until they get right to the end and those old ferry platforms, which sit much closer to the water level. 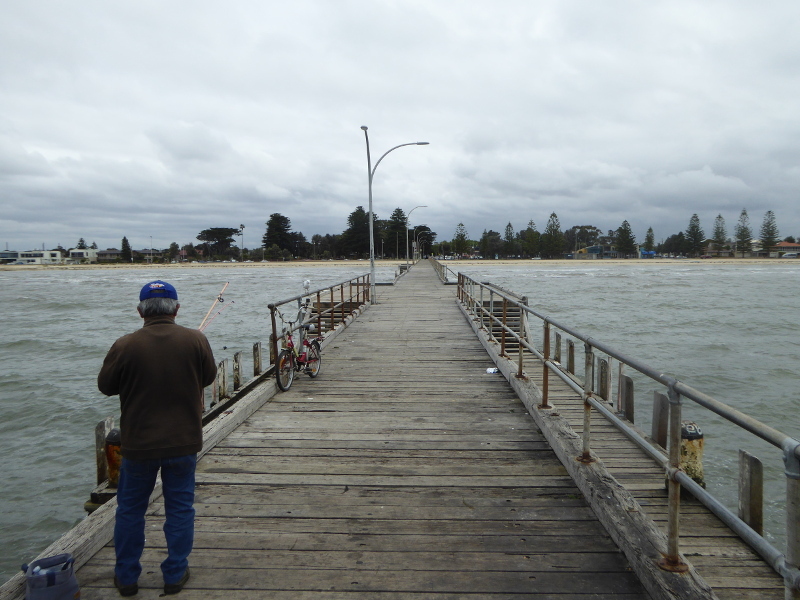 It was pretty windswept by the time I reached the end of the pier and joined the four fishermen quietly going about their business. 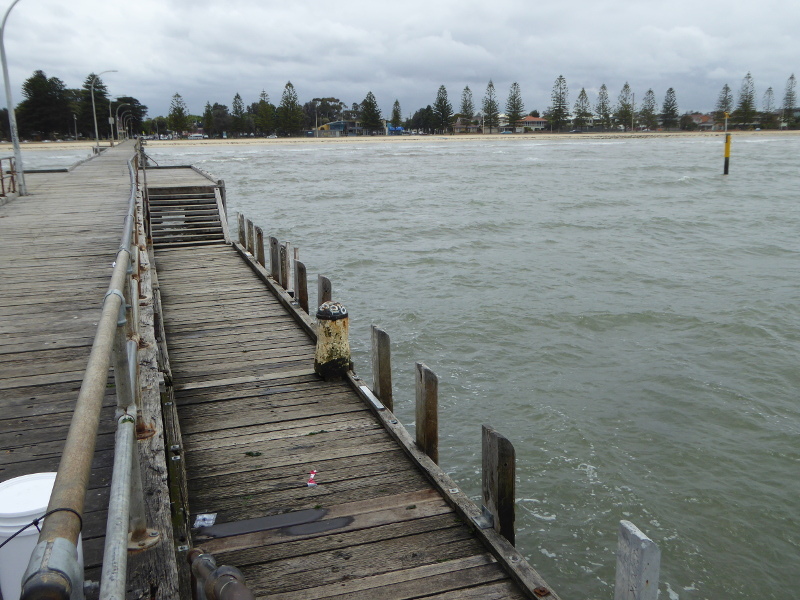 This must be a wet place to fish if a storm hits Altona, so I’m not surprised that quite a few of the planks appeared to have been replaced quite recently; I can imagine Altona Pier gets quite a battering some days. The fishermen were the usual taciturn types, though I did get a smile and a greeting from the elderly Vietnamese gent who was packing up for the day and got back on his little bicycle to make his way back to land along the boards. 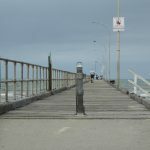 On the eastern side of the pier, there is a rusting iron fence, which would probably be quite a security support in a wild wind, because all along the western side there is just a 10cm high block of wood to stop you slipping into the water. 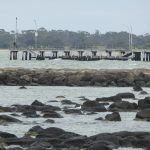 Down at the end of the pier, there are views westwards towards Avalon Airport and back towards Williamstown in the East. 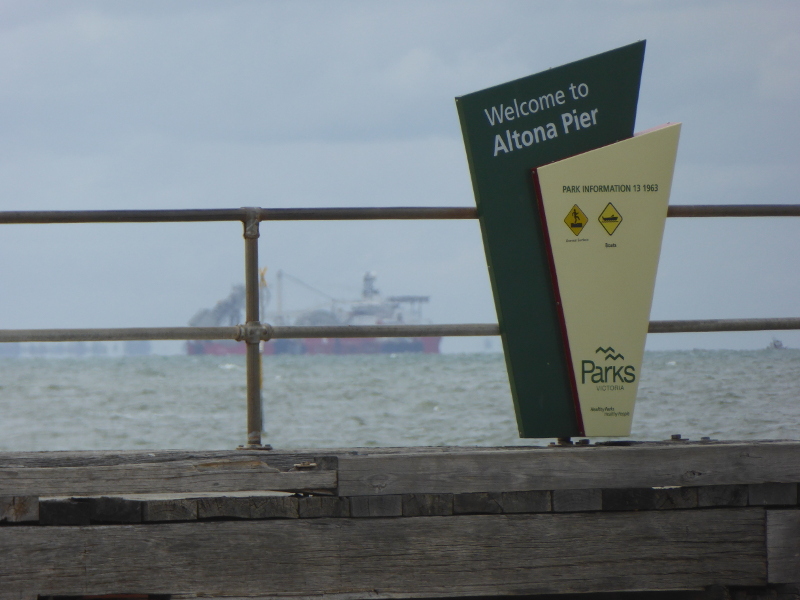 Over in the far distance loom the Dandenong Ranges, but even at 400m or longer, Altona Pier doesn’t quite extend far enough out to see Melbourne. 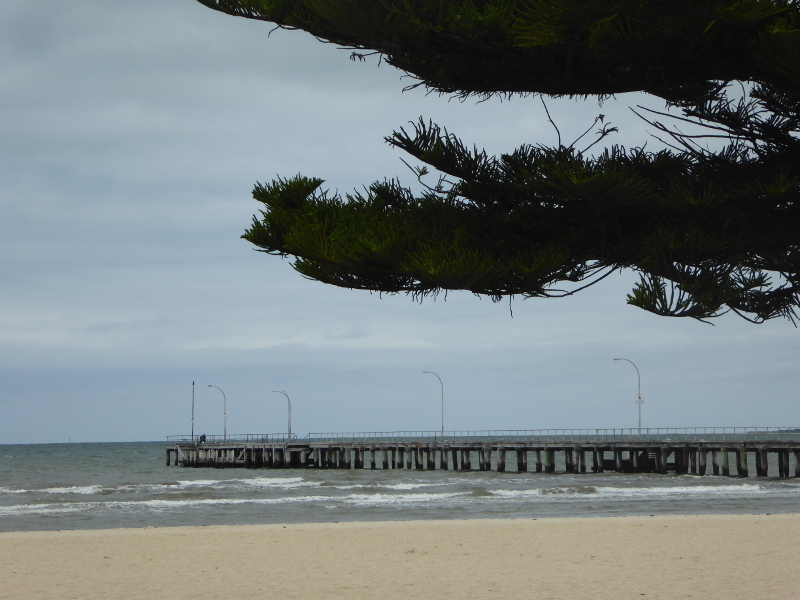 It was a late autumn midweek morning when I made my visit to Altona, so there weren’t too many people out and about. One Indian-looking couple started the walk together, but she turned back by the bench, suggesting it was just too far to go in a saree in that wind, while he soldiered on to the end. On the beach was a group of young women doing life-saving training, a sign that summer is on its way, and the rather modern-looking Life Saving Club building was just to the west of the pier (with showers and lockers for hire, by the way). 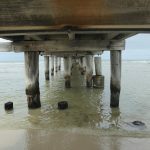 Oh, and it’s worth taking a look under Altona Pier by walking over the sand to the water’s edge and peering along the avenue of wooden piles driven into the sea bed to for the pier’s base. I did stroll another ten minutes along the beach westwards because I wanted to try a coffee shop down that way, and was pleased that I did, because I also came across Flemings Pool, which is no longer really a swimming pool sadly, but it does look a nice spot to fossick in the rock pools, and the Flemings made for an interesting search afterwards on Trove’s website. No shelter once you are on the pier. Toilets in Langan Reserve just to the west of the pier. Showers and locker hire in the Life Saving Club building just to the east of the pier. 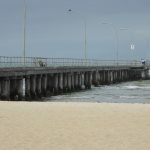 The Bacchus Marsh Express of 15 September 1888 makes the first mention of the ‘almost complete’ Altona Pier, so I’d say this pier dates from 1888 rather than the year earlier mentioned on the information signs at the end of the pier now. Big crowds had gone to Altona on a free trip by steamer (to the pier) or train to watch the auctioning of the first land lots up for grabs in Altona. And there were similar crowds in December 1888 when the Caledonia Society organised its annual picnic in Altona, two bagpipers marching the crowd off the ferries along the pier to the marquees set up nearby. 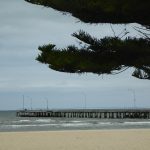 The report in The Argus newspaper also mentioned the two miles of pines skirting the beach at Altona, and they are still there today. 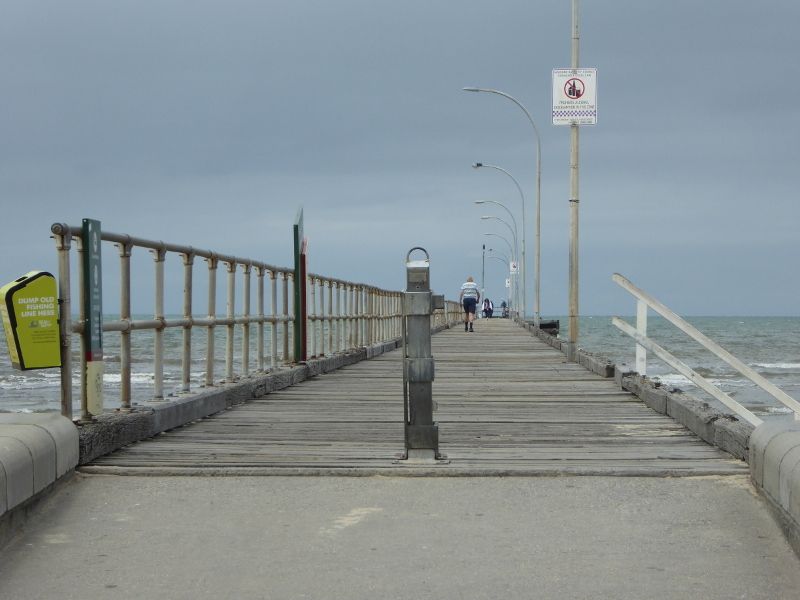 The photo on the information board by the pier shows a shop standing by the start of the pier. This may well be Mr Davey’s store, mentioned in the Williamstown Chronicle in 1920. A ‘cosmopolitan’ place, said the Chronicle, Mr Davey caters ‘for all classes’, and has tea rooms and dressing rooms for bathers as well as his store. What a shame it isn’t there anymore! 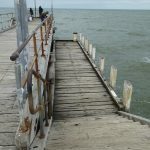 By 1932 the pier had fallen into a state of disrepair (ferries had stopped by then and it was ‘used only by fisherman, swimmers and promenaders’, said one newspaper). It’s actually thanks to the public spending available for ‘unemployment relief’ in the 1930s that the pier was saved and repaired. 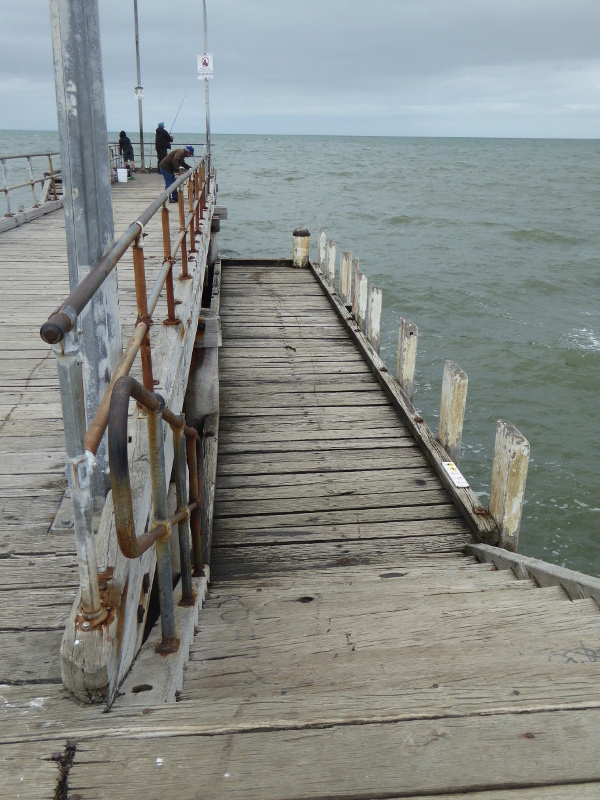 It still took years to have the pier properly restored, though. A Minister visited in 1946, funds were finally found in 1947, but then supply issues slowed things down and work only began in 1950. 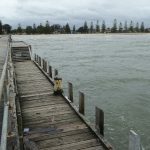 Funnily enough, press reports on Trove website then dry up and there seems to have been no major celebration of the newly re-built pier. Or was there?? 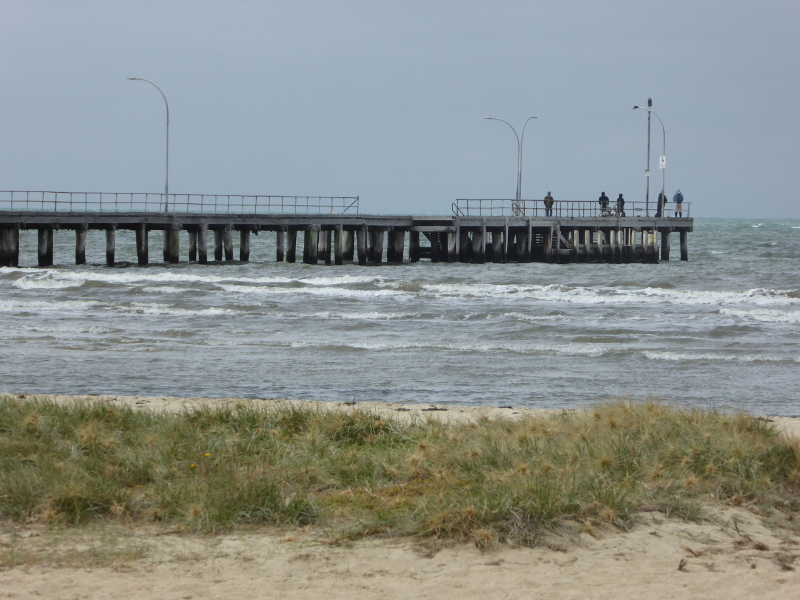 Falling into the sea by accident off Altona Pier seems to have been quite a common occurrence over the years. In 1952, a school girl called Margaret Davis fell off her bike straight into icy waters in the month of May. She was rescued by a guy called John Gilmore of the local Life Saving Club. Are either of these two still around today to retell what they remember of that story? But hero of several hours was local clothes factory manager Harold Bryant, who four times over a few years rescued people who had fallen into the sea near here. In the last such incident, in June 1954, he said he had struggled to pull the victim onto his boat as he was at least 12 stone and ‘full of water’, and was still at risk of drowning in the boat as the plywood dinghy had by then taken on a fair bit of water too. 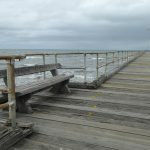 This Domain Real Estate advertorial mentions the ghost tours that include Altona Pier. OK, so I hadn’t realised there were ghosts here, too – what old stories do they tell? 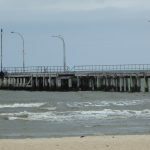 Big crowds visited Altona Pier during the Pokemon craze of 2016. This link from the Sydney Morning Herald site has a video clip of that. 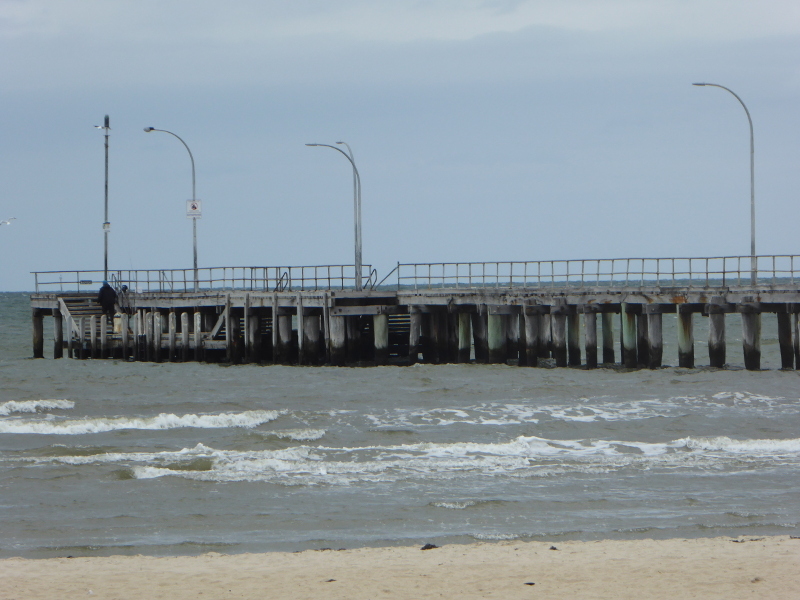 The only other writing I found on Altona Pier came from the Victoria Heritage Council website. 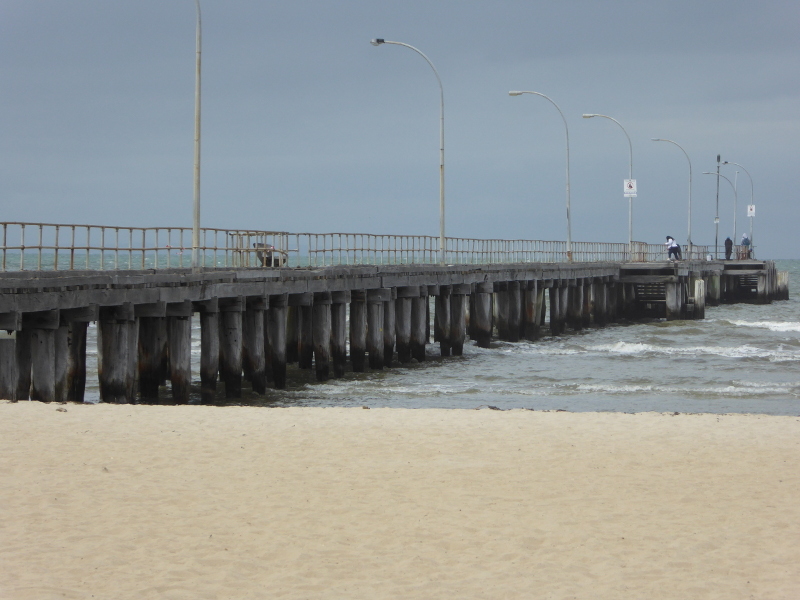 What are your stories and memories of Altona Pier? 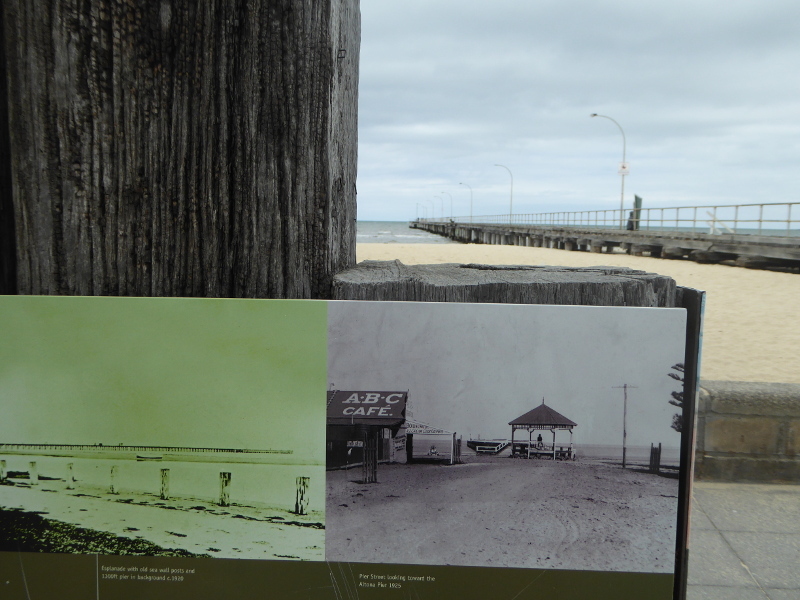 Have you seen many changes to Altona Pier over the years? 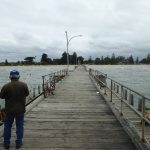 Can you even remember far enough back to when they reopened the newly refurbished Altona Pier after the war, or some of the 1950s rescues I read press clippings about? Bezirk Café is worth the walk along the beach ten minutes west. The coffee is a decent Campos brew, but it’s just a nice neighbourhood coffee shop with better atmosphere than the (possibly better coffee) café and ice cream parlour back on Altona’s Pier Street.